Managing the network configuration and change control processes are important, yet time consuming jobs for Network Admins. When a network configuration is changed, many things can go wrong. The change may not be approved or wanted. The change may not be saved or documented. And worse, the change can break something. The impact of configuration changes to the network can be significant. They can degrade network performance. They can result in failure to comply with regulatory standards like SOX, PCI, HIPAA and FISMA. And they can compromise network security. WhatsConfigured automates configuration and change management for the routers, switches and firewalls on your network. It archives and audits network configurations, and alerts and reports on any changes. WhatsConfigured is a valuable tool that enables Network Admins to ensure that all devices are running authorized configurations, to secure the network and comply with regulatory standards, and to reduce the time and costs associated with manual and repetitive configuration and change management tasks. Automatically inventory and store configuration files in a secure repository. Automate configuration changes like passwords or enabling/disabling functionality to eliminate accessing each device individually. Leverage configuration change audit trails for regulatory compliance and to restore device configuration. Get alerts and account for every change made to your network, including unauthorized changes. Meet security and compliance guidelines with unlimited stored versions of configuration files and templates for key compliance reports. WhatsConfigured logs all device configuration events, including file changed and time of change, for audit and control purposes. Identify unauthorized changes for each network device. Schedule and execute configuration changes for individual or multiple devices at optimal times. Experience less network outage time by quickly downloading or replacing configuration files. Search and compare configuration files to simplify troubleshooting. Log all device configuration events, including file changed and time of change, for audit and control purposes. Meet your business requirements with export/import custom configuration tasks and associated scripts. Search stored configuration files across global archives to streamline troubleshooting and configuration management tasks. Save time and reduce errors by deploying customized task scripts to execute following a configuration change; e.g. rebooting a device once the configuration file has been updated. Run scheduled or on-demand tasks, including backup and restore of startup and running device configurations, to save time and reduce errors. Complete compliance reporting with out-of-the-box reporting. Enforce policy monitoring whenever you backup a configuration. Download and store unlimited versions of configuration files for each network device to meet security and compliance guidelines. Set up policy definitions for dynamic audit during configuration back up to ensure conformance to policy. Support compliance requirements for HIPAA, SOX, FISMA and PCI DSS using integrated reports. Use formatted reports of archived configuration change audit trails for a device or groups of devices to ensure accountability and traceability. Get an alert when a device configuration file changes authorized or not; then download the running configuration file and initiate an automatic comparison with stored configuration files to highlight differences and speed up operational response. To ensure consistent network performance, get an alert when the configuration backup task fails to run on a device or when a scheduled or scripted configuration task fails to execute. Get an alert when an on-demand configuration backup or scheduled task fails a policy audit, to help ensure configuration consistency. WhatsConfigured is a fully integrated plug-in for WhatsUp Gold or available as a standalone application. Use WhatsConnected to automatically discover, map, search, inventory and document your entire IT infrastructure – network devices, servers, workstations, deployed software, VMware virtual machines, VLANs and port-to-port connectivity – in minutes. With WhatsConnected, you can easily document your infrastructure inventory and generate topology and give your team the power to accurately visualize how everything on your network is connected. Understand detailed physical connectivity, device type, and configuration information of anything with an IP address. Quickly pinpoint network performance issues visually with auto-generated topology maps. Automatically maintain a comprehensive network and server inventory of physical connectivity, device asset information, configuration information, systems inventory, more. Get accurate, comprehensive reporting for compliance. Easily share information with exports to PDF, Visio, CSV, and Excel. Truly understand your network including detailed physical connectivity, device type, asset/inventory and configuration information of every asset in your network. Save hours of manual intervention by leveraging multiple Layer 2 and Layer 3 discovery technologies like ARP, SNMP, SSH, Virtual Infrastructure Management, IP addressing, ICMP and LLDP. Get comprehensive inventory and configuration reports from Windows and other servers with agentless polling techniques via SNMP, SSH, WMI and Telnet. Gain visibility into even the most vendor heavy networks with inventory capabilities, platform identification, and classification for the most widely deployed network equipment manufacturers. Quickly pinpoint network issues visually with auto-generated topology maps. Obtain full visibility into both physical and virtual connectivity, including VMware host-guest relationships. Gain confidence in your network with consistent up-to-date maps that automatically find and map new devices, Layer 2 connectivity changes, or updates to physical or virtual associations. 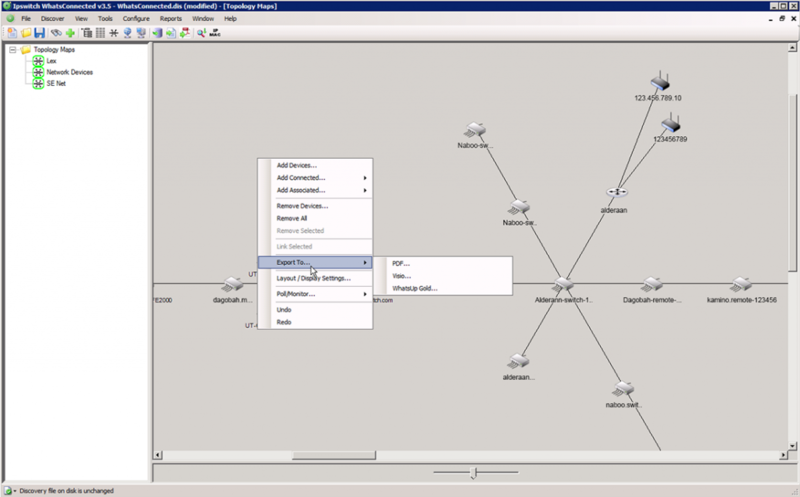 Customize maps to show any aspect of the topology to view specific areas of the network. Collaborate easily with other teams with saved, printed and shared maps. Be ready for compliance with comprehensive inventory and configuration management. Get reports on your physical topology in either spoke, hierarchical or custom views, both physical and virtualized infrastructures. . Easily share maps in Microsoft Visio or PDF format. Use standard reports like: Inventory, Device Connectivity, Bridge Port Utilization, Windows Inventory, and VLAN & Subnet to meet requirements or regulations faster. Capture important asset administration data like detailed asset information, configuration information, and systems inventory so you have up-to-date, compliant, easy to read information about your entire network. Collaborate with other team members or share information with stakeholders using maps exported in PDF. Customize drawings with map exports to Microsoft Visio. Make it easier for non-technical stakeholders to understand your network with exported maps. Show how device additions and changes in your network design impact your network. Integrate inventory and connectivity information with other standard departmental reports by exporting either in CSV or Excel format. WhatsConnnected is available as a standalone application. WhatsUp IP Address Manager automates the discovery, documentation and management of your IP space. Why do organizations need IP Address Management (IPAM)? The proliferation of IP telephones, mobile computers, and virtual machines has made the planning, allocating and managing of IP addresses more complex and critical. A mismanaged IP space can cause network outages, increase troubleshooting time, or cripple an otherwise healthy network. Enterprise-ready IPAM products simplify IP address management by automating previously manual tasks and provide visibility into IP utilization, duplicate IP Addresses and enable the correlation of IP addresses to devices historically. WhatsUp IP Address Manager relieves the risk factors from the Network Administrator by automating the tedious tasks associated with IP address management. WhatsUp IP Address Manager is an enterprise-ready IP Address Management solution. WhatsUp IP Address Manager automates the discovery, documentation and management of your IP space and provides visibility into DHCP/DNS server configurations, IP Address utilization across subnets and device-to-IP Address associations. WhatsUp IP Address Manager stops the chaos of manually managing your IP space with error-prone spreadsheets and unreliable home-grown databases. SCOS Software BV provides solutions that are used in the top 100 companies in Belgium, the Netherlands and Luxembourg. SCOS offers comprehensive Managed File Transfer solutions for file sharing, cloud synchronization of data, collaboration, backup, replication and archiving.